As the world’s premier Success Expert and best-selling author of over 80 books that have been translated into 42 languages, Brian Tracy’s exact step-by-step process has been distilled down into one easy-to-follow course that will help you write and publish your own best-selling book, faster than you ever thought possible. 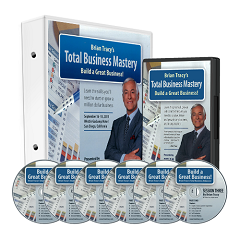 With Total Business Mastery Home Study Program, you’ll learn the skills, strategies, and techniques to building a THRIVING business in ANY market! Get the ideas and the inspiration PLUS, a specific plan to create your million-dollar—or multi-million-dollar—business! Learn how to get what you want in life (and business) no matter what the economic climate is. When you arm yourself with THE system proven to result in success, you will become more successful. Learn how to maximize your income and minimize your effort through the real secret to unprecedented success. When you have absolute clarity about what you want, and how you’re going to get it, you’re able to focus on what’s important, so you get more done in less time. Achieve peak performance with Success Mastery Academy. Learn how to set your goals and objectives to maximize your performance and blast through your goals. Success Mastery Academy is the most advanced and life-changing seminar program on personal success and achievement. Become a high performance seller and learn how to close that life changing deal. High Performance Selling is the complete A-Z “how to” sales training guide. With this program you will learn to dramatically improve your closing rate and massively increase your income. "Brian, after taking your writing and publishing tning course in 2010, I wrote my first book and just learned that my 2nd book is projected to hit #1 on the New York Times Best Seller list on the August 20th, 2012! I'm getting booked for Kelly Live, the View, The Talk, plus more! If that doesn't validate what you teach 1st time authors, than I don't know what does!" "What I like most about Brian's Total Business Mastery Home Study Program is that these aren't things that will take 30 days or 90 days to show results, these are things you can apply each and every day. Walking into the office Monday morning you're going to have a hit list of things to work on! I would absolutely recommend this to any business entrepreneur who's looking to establish themselves or grow their company to the next level." 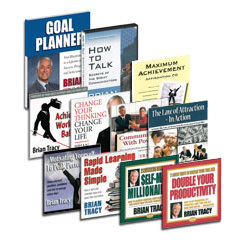 "Brian Tracy's programs have changed my life, personally and professionally. He is the master at getting right to the heart of a subject. He synthesizes the very best ideas into one place and packages them into a system that gets results. Charles Tremendous Jones once said, "The difference between you today and the person you'll be in seven years are the people you meet and the books you read." 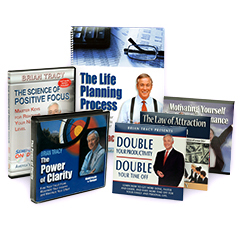 My life is forever better because of Brian Tracy's influence through his coaching, his tapes, and his books. Thanks Brian." "If You Can Only Afford 1 Program then you should purchase this program. 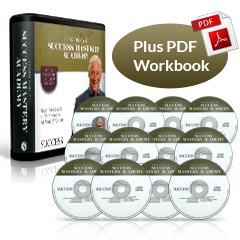 I've been a Brian Tracy fan for over 20 years and have purchased over 20 of his excellent programs, and feel this program is sort of "A Greatest Hits" Album! I'm not saying that his other products were not of value (every one of them I found of great value!) However, I personally feel that if you applied what Mr. Tracy talks about in ""The Power of Clarity"" you can easily take 10 years off your success learning curve, which to me is easily worth a month's salary!" "Thank you for your programs! Two years ago, I puchased your "Success Mastery Academy" package. Your fast paced, entertaining delivery struck a chord with me and I decided to begin challenging myself more. Before puchasing your program, I was struggling with my business, especially in the areas of "committing to be the best" and "time management". Since then, I've multiplied my company's income by 4 times, and will multiply it another 5 times in the next 5 years. Thank you again; you have provided tremendous value to me, and literally helped change my life for the better. I hope that you continue to share your message with the world." "This is the best sales training tool I have ever seen. This has radically improved my sales results. I think the best thing about this program is that in every session I have learned something new. And there are specific action items that have helped me to actually changing up my sales game. In the past 30 days I have improved my sales by 27% percent. I can’t wait to see how the rest of the year looks.